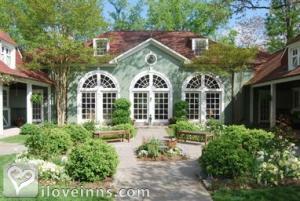 Leesburg bed and breakfast travel guide for romantic, historic and adventure b&b's. Browse through the iLoveInns.com database of Leesburg, Virginia bed and breakfasts and country inns to find detailed listings that include room rates, special deals and area activities. You can click on the 'check rates and availability' button to contact the innkeeper. One of the most historic towns in the country is found in Loudoun County in Virginia - Leesburg. Located west-northwest of Washington D.C. at the foot of the Catoctin Mountain in front of Potomac River is where Leesburg is. Over the past 30 years, Leesburg has considerably grown from being the rural town that it was into a suburban center that it is today. There are many attractions here and more than 20 of them have been listed in the National Register of Historic Places, the first of which is the Dodona Manor, where George C. Marshall lived and died. Some of the other favorites include Morven Park, the Oatlands Plantation which is a National Historic Landmark, and White's Ferry, the only working ferry crossing the Potomac River. Do not forget to stay at Leesburg bed and breakfast inns. By Leesburg Colonial Inn.